It has been said that Conn trumpets, especially those from before the mid-1950's, work best with original Conn mouthpieces. I decided to look into this. The short answer is: Yes, these mouthpieces have slightly different shanks, which is why they work better in Conn trumpets from the 1930's through the mid-1950's. In this article I will explain why. Recently (October 2007) I bought a Conn "Precision" 3 mouthpiece off eBay. 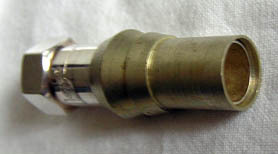 The "Precision" line of mouthpieces were the standard Conn mouthpiece from about 1936 through the mid 1950's. The number 3 is identical to the more common number 4 except for the rim, which isn't relevant to this article. I have also picked up a so-called "New Old Stock", that is, unused, Conn trumpet receiver as used on Conn trumpets from the 1930's through about 1954. This is a part that is soldered into the leadpipe. After the instrument has been lacquered or silver plated it isn't obvious that it is a separate part, but it is. It is 0.996" long. The picture below shows the Precision 3 and the receiver. This is the receiver I used for all my tests. The measurements I got from it using my digital calipers with the pictured Precision 3 mouthpiece exactly match the measurements of the same Precision 3 mouthpiece in my 1941 22B New York Symphony. I own a Josef Klier 1½C mouthpiece which is a Bach copy, standard modern mouthpiece. When it is inserted into our test receiver it goes in to a depth of 1.058" and consequently protrudes from the end of the receiver by 0.062". See picture below. 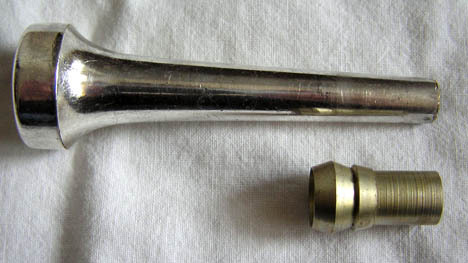 This is typical of modern trumpet mouthpieces. I have tried several, including a few cornet to trumpet adapters (which I use most of the time myself when playing the trumpet for reasons not relevant here), and they are all very similar in that they protrude from the end of that receiver a little. This mouthpiece doesn't come up to the end of the receiver. After measuring this mouthpiece, Kanstul tell me that while the taper is still a Morse taper at 0.05" per inch, the overall diameter of the shank is 0.005" larger than the standard Bach mouthpiece. 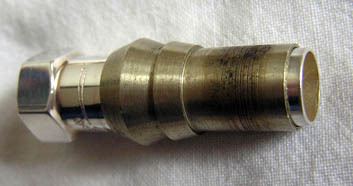 This results in an insertion depth of 0.1" (2.56 mm) less than a standard Bach mouthpiece. This is very important: The shank on Conn mouthpieces from this period inserts 0.1" less deep than a modern mouthpiece. In other words, although the Conn trumpets from that period that I have seen (such as the 22B) don't have a distinct "gap" in the strict sense of the word but more a narrower section, the result is the same: a modern mouthpiece in a Conn receiver from the 1930's - mid 1950's will sit too far into the receiver and behave as if the gap is too small. This means that as you play higher, the resistance will increase more than it should. What can be done to remedy this situation? The easiest way to quickly test the difference on a particular instrument is to wrap a single layer of tape around the end of a modern mouthpiece. I have done this to my GR43 cornet to trumpet adapter by folding over a small section of tape onto itself and wrapping the rest in a single layer around the end of the mouthpiece, leaving it about 1/32" or about 1 millimeter short of the end of the mouthpiece (or adapter, in my case). The folded over section gives you something to grab onto and easily remove the tape. 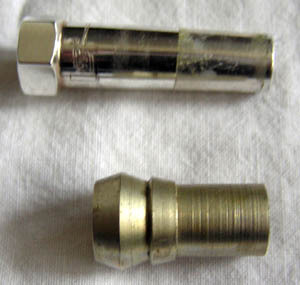 As you can see, the picture on the right with the tape is very close to the insertion depth and hence gap of the original Precision 3 mouthpiece. Again, very close to the original Conn Precision 3 mouthpiece. The result of the taped adapter pictured above in my 1941 22B New York Symphony was that it went from having unusually high resistance as you played higher, to much closer to the amount of resistance you would normally expect. It has improved the playability of the trumpet considerably!